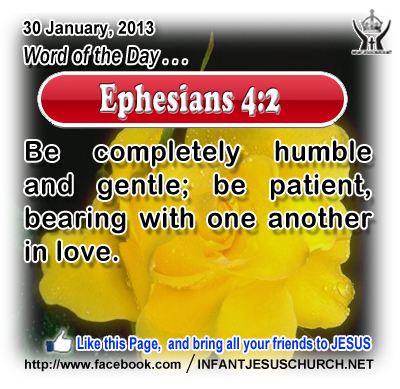 Ephesians 4:2: Be completely humble and gentle; be patient, bearing with one another in love. Heavenly Father, give us strength and patience, that we may be as loving, gentle and patient with others as Jesus was with people during his earthly ministry and you have been with us. In the name of Infant Jesus, our Lord we pray. Amen. 1Again he began to teach beside the sea. And a very large crowd gathered about him so that he got into a boat and sat in it on the sea; and the whole crowd was beside the sea on the land. 2And he taught them many things in parables, and in his teaching he said to them: 3 "Listen! A sower went out to sow. 4And as he sowed, some seed fell along the path, and the birds came and devoured it. 5 Other seed fell on rocky ground, where it had not much soil, and immediately it sprang up, since it had no depth of soil; 6and when the sun rose it was scorched, and since it had no root it withered away. 7Other seed fell among thorns and the thorns grew up and choked it, and it yielded no grain. 8And other seeds fell into good soil and brought forth grain, growing up and increasing and yielding thirtyfold and sixtyfold and a hundredfold." 9And he said, "He who has ears to hear, let him hear." 10And when he was alone, those who were about him with the twelve asked him concerning the parables. 11And he said to them, "To you has been given the secret of the kingdom of God, but for those outside everything is in parables; 12so that they may indeed see but not perceive, and may indeed hear but not understand; lest they should turn again, and be forgiven." 13And he said to them, "Do you not understand this parable? How then will you understand all the parables? 14The sower sows the word. 15And these are the ones along the path, where the word is sown; when they hear, Satan immediately comes and takes away the word which is sown in them. 16And these in like manner are the ones sown upon rocky ground, who, when they hear the word, immediately receive it with joy; 17and they have no root in themselves, but endure for a while; then, when tribulation or persecution arises on account of the word, immediately they fall away. 18And others are the ones sown among thorns; they are those who hear the word, 19but the cares of the world, and the delight in riches, and the desire for other things, enter in and choke the word, and it proves unfruitful. 20But those that were sown upon the good soil are the ones who hear the word and accept it and bear fruit, thirtyfold and sixtyfold and a hundredfold." Jesus' parable of the sower is aimed at the listeners of his word. There are different ways of accepting God's word and they generate different kinds of fruit accordingly. There is the biased hearer who has a shut mind. Such a person is un-teachable and sightless to what he or she doesn't want to hear. Then there is the superficial hearer. He or she fails to think things out or think them through; they lack deepness. They may at first respond with an emotional reaction; but when it wears off their mind roams to something else. Another type of hearer is the person who has many notices or cares, but who lacks the aptitude to hear or comprehend what is truly important. Such a person is too busy to pray or too anxious to study and meditate on God's word. Then there is the one whose mind is open. Such a person is at all times willing to pay attention and to learn. He or she is never too arrogant or too busy to learn. They listen in order to know. God gives grace to those who appetite for his word that they may understand his will and have the power to live according to it. Do we hunger for God's word? Loving Infant Jesus, faith in your word is the way to wisdom, and to ponder your divine plan is to grow in the truth. Open our eyes to your deeds, and our ears to the sound of your call, that we may understand your will for our life and live according to it.